So Superbowl Sunday is once more upon us, and you may be asking yourselves how you can enjoy a Superbowl party on your gluten free diet. Well, easy, first make sure there are options if you're going to someone else's home, and of course if your at your own home-- you're in the clear! When my gluten free child is attending a party at a friend's house, or we're going to a meal outside our home, I first call in advance and say, "I'm happy to bring my own food for Lillie, but I wanted to check if you're serving anything she can eat first." That takes the pressure off them, stating from the beginning that basically they don't have to provide anything specifically gluten free. If you're putting out a spread at home, you can certainly make it all gluten free. I find that a crock pot full of chili or soup is a nice centerpiece. Add some GF breadsticks or Jalapeno-Corn Muffins (see recipe below), gluten free franks in blankets and a deli spread are great. 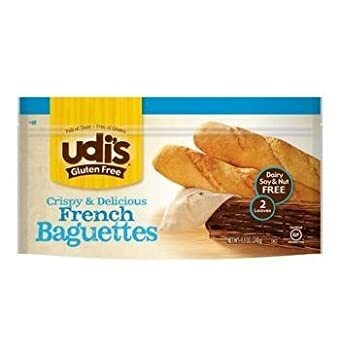 Udi's French Baguettes are most awesome for heros, hoagies, subs...or whatever you want to call them! If you wish to offer GF and "glutenfull" options, take a disposable green tablecloth and use white duct tape to recreate the lines and number of a football field. You can have the GF end zone and the gluten end zone, with the 50 yard line being the dividing point. Make "Go Team GF" banners to pin to the gluten free end to avoid confusion. Whatever you choose to do, don't let food get in your way of fun. I always advise people on special diets, to focus on the fun, not the food when they go out to a party or meal. Plan ahead so you have something to eat, and will feel sated, but remember the point of a gathering is good friends and good fun! This recipe calls for cheddar cheese. If you would like it to be dairy-free, I suggest using Daiya Cheddar Style shreds (and soy milk). This can be made in a 24-cup mini muffin pan. Reduce baking time to 12-15 minutes. You'll have mini jalapeno-corn poppers! Pre-heat oven to 400F degrees. Line 12 standard muffin cups with paper liners. Spray lightly with non-stick cooking spray. In a large mixing bowl, whisk together egg and buttermilk. Whisk in oil, until well combined. Add Bisquick and cornmeal, and whisk until combined. Fold in cheddar cheese and jalapenos until blended. Bake in pre-heated oven for 20 minutes, or until golden brown. Cool in pan 5 minutes, then remove to rack to cool an additional 10-15 minutes. These can be served warm or cold...but are best warm!